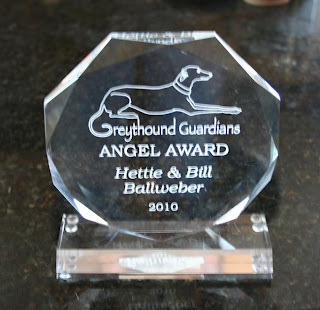 It’s with greyt pride that we announce that our group has been awarded one of the 2010 Greythound Guardians ANGEL AWARDs for our work in finding homes for Craiger’s List dogs. The award was presented to Hettie at the organization’s Sandy Paws event held in Jekyll Island, Georgia from March 5-7, 2010. Greythound Guardians, Inc. is a non-profit organization that raises funds to help greyhound adoption groups. The Sandy Paws event is one of their primary events for the purpose of raising money for their organization so that they can pass it on to other groups through grants. which contains the names of eleven other inductees since 2006. We thank all of our volunteers and adopters who made this award possible by working hard to place Craiger’s List dogs and especially to those who adopted them. You are all special people. We have long advocated for the individual greyhound. We do not place an emphasis on how many hounds we place, but how many of those hounds stay in their homes for their lifetimes. To date, our return rate has still remained under 8% when averaged over a nearly five year period. This is what gives us the most pride! We thank those people who know what the word commitment means when it comes to adopting a pet.